Brooke is doing great. She follows our dog Blondie around. Our little boy comes home from daycare and the first thing he says is, "Girls, I'm home, Blondie, Brookie". He has to pick Brooke up to give her a hug. I think Brooke is happy, I know we are. 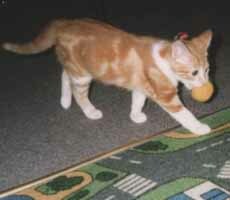 Brooke's favourite toys are the little yellow ball you gave her and she has a little yellow mouse and a white one. Brooke is so cute when she carries her little toys in her mouth. We love Brooke to pieces. She's so loving to us. We would recommend anyone going through Animal Welfare.